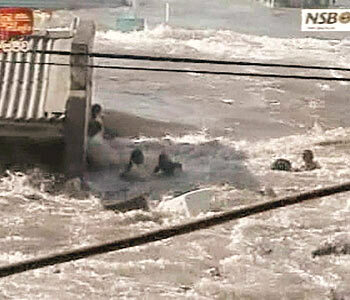 I can't really add much to the Tsunami coverage, as it is already all over all the media. It is tragical and devasting of course. I don't know how to deal appropriately with over 100,000 dead and many more personal tragedies. Strange that I can't personally even relate to it before I read that there are still around 500 Danish people missing. That's about a 10 times bigger chunk of Denmark than 9/11 was to the U.S. And 1500 Swedish people. But the much bigger disasters were for many faraway villages that can't even be properly accounted for, and many of which no longer exist. Otherwise the only thing I can say is that it shouldn't have happened. Well, you can't stop the biggest earthquake in memory from happening. But it took several hours for the tsunami to hit the beaches it hit. It is an example of terrible communication systems that most people had no clue. The U.S. military and the State Department knew, and secured the Diego Garcia military base. But it succeeded in alerting only two foreign governments. The top meteorologists in Thailand knew, but they decided to not tell anybody, to not disturb the tourist industry. As if an unexpected tsunami isn't a lot more disturbing. And, anyway, there wasn't much of a system in place to warn anybody in most places. The people who knew didn't quite know who to contact. Interestingly, the animals knew, even if nobody told them in advance. There were largely no dead animals, because they can sense stuff like that coming, and instinctly get themselves to safety. "The scientific evidence for a sixth sense is lacking, but if the reports are confirmed, they could add to the understanding of animal behaviour and possibly even be used in the future as an early warning system for humans." If that warning system inside of us is discovered (probably by scientists), then we may use it for ourselves (but we'll probably have to buy a license or something). Yeah, doesn't that sound pretty stupid there. The sense of animals for that kind of thing is both easily observed, studied, tabulated, verified, etc. So "lack of scientific evidence" just means that nobody's been able to cut out some part of their brains and say that it is their sixth sense. And of course we have it too if we can just manage to quell the noise in our heads a little bit. Of we just need to watch where the animals are headed. The sophistication of the weather satellite system, I belve is able to predict the occurence of tsunami's. Perhaps there was no one to watch at the time, or no one thinks it important enough to develop their extraterrestrial sensors for that purpose. Perhaps they just do not have the right software. Humans long ago lost the "sixt" sense and probably it is something that would be impossible to regain. We are just too busy and too dull. The "sixt" sense still exists, only it is mostly used by teenagers who can sniff out a party going on from miles away. We can learn so much from the animal kingdom is we truly tune into what is around us. Time and again they give us messages we just fail to recongise them. We are learning however. On the early warning to you honestly think that the people would put tourism ahead of saving lives? Firstly there was a lot of confusion about who to contact to get the message out. Some of the areas worst hit are just so remote and if you haven't been there this is hard to comprehend so communication is difficult at the best of times. There is more to this story not just associated with the earthquake. Yeah, that´s the bit of information that we all can save for ourselves. The natural world "knows" things that we may have forgotten. Of course, in the PROGRESS oriented Establishment's mind, we MIGHT use animals as ALARM clocks... but, ohhh no, we should NOT USE our own instinct! PROGRESS is after all a cover up for every step Humankind as one single Unit takes FARTHER AWAY from ANYTHING Natural/GOD-GIVEN!!! The price we paid: all the tsunami victims, including Nature on the Islands that succumbed to the tsunami is part of the victim-account. ...just maybe the sacrifice of many was to do exactly what you are saying - jolt the rest if us into action - WAKE UP dummy call - and then yes, the end of slavery and true freedom will be ours. Big lesson also - listen to your inner voice- so true.... I was supposed to be on vacation in one of the areas that was badly impacted. Something spoke to me and I stayed home. I am very glad I did. Then again, perhaps I am just dreamer....perhaps..
2 Jan 2005 @ 18:09 by bushman : 10 years old. PHUKET, Thailand - Quick-thinking 10-year-old Tilly Smith is being hailed as a hero after saving her parents and dozens of fellow vacationers from the deadly tsunami - thanks to a school geography lesson. Tilly warned the doubting adults at a resort that a massive tidal wave was about to strike - just minutes before the deadly tide rushed in and turned the resort into rubble. Tilly's family, from Surrey, England, was enjoying a day at Maikhao Beach last Sunday when the sea rushed out and began to bubble. The adults were curious, but Tilly froze in horror. "Mummy, we must get off the beach now!" she told her mother. "I think there's going to be a tsunami." where no one was killed or seriously injured. Last night, Tilly was being hailed as a savior. "I think it's phenomenal that Tilly's parents and the others on the beach are alive because she studied hard at school," said Craig Smith , the American manager of the JW Marriott Hotel where Tilly's family was staying. He said a tsunami is not like you see in the movies, where a huge wave wells up on the horizon and can be seen for miles off shore. It is more like a sudden surge of water," he said. "There's very little warning. Tilly shrugged off the attention and modestly said, "Last term, my geography teacher, Mr. Kearney, taught us about earthquakes and how they can cause tsunamis. "I was on the beach, and the water started to go funny. "I recognized what was happening and had a feeling there was going to be a tsunami." "When the water went back, I was like most people on the beach. I wanted to walk down and look at what was going on," she recalled. "It was only when Tilly explained what she thought was going to happen that I had second thoughts. "We ran off the beach as fast as we could and went to the first floor of the hotel where it would be safe. Minutes later the water surged right over the beach and demolished everything in its path. "It was terrifying to watch but I'm very proud of her." Q: Can you describe the scenes of devastation youve seen in Banda Aceh, Indonesia? Banda Aceh, at the tip of the island of Sumatra, is basically ground zero. Its the epicenter of the quake, which hit just about 40 miles southwest of here in the ocean. It devastated the area. The destruction is hard to describe. Even seeing videotape of it doesnt do justice to how devastating this earthquake and tsunami have been to the area. Ive traveled a good distance around Banda Aceh by now, and the things that you see are unimaginable, like Dantes "Circle of Hell." Theres devastation, total destruction, maybe a few pillars standing and a few bricks as far as the eye can see. The most disturbing aspect is that when you look at this landscape of destruction you see so many personal effects. You see purses and photographs, dresses still on hangers. You see things that are very much testament to the fact that people have lived here. Not just destroyed buildings. But the personal effects of the people that lived there  which makes it very real. And then on top of that, when you see this destruction, your eye is drawn to certain colors  usually the colors of the bodies that are lodged within this debris. Bodies that have turned black from decomposition, and you can make out human forms despite all the different shapes of the debris, the bricks, the wood, the clothing, all of those things. Your eye is drawn to the hands sticking out of the rubble or feet sticking out of the rubble, bodies twisted in unspeakable positions  just the horror of what these people experienced in their last moments of life. It is quite a difficult thing to take for anyone to see it. When you actually walk through there, the smell of death is so pungent. It stays with you, this sickly sweet smell that is unlike any other smell in the world, and there are these huge swaths of Banda Aceh where that is all you can smell. Q. How are survivors coping in the midst of this death and destruction? The upside of this whole thing, if there is an upside at all, is that there is so much work to be done just to keep surviving. Just the daily chores of survival require so much of the people here that they have to stay very busy. The very process of getting food and water for themselves takes a lot of energy. They have to stay in long lines for a few hours at a time to get a few cartons of water or to get food. Some people spend their time searching for missing family members  really with little hope of finding them alive  but with great hope of finding at least their bodies so they can have some closure. Its very important to them. They dont want them lost in this debris forever and to never be able to say goodbye to them in a proper way. That is a process that takes up a lot of their time. That is the psychological mode these people are in now. What is it going to take for us to survive and how do we find our missing family members. They are not only physically traumatized by what theyve experienced here, but emotionally and psychologically as well. You cant be in an environment like this without experiencing a great deal of loss and a huge sense of empathy. As outsiders it is a story that you cant detach yourself from it. You live with in this environment that has seen the wrath of nature in a way that very few places have experienced. So, you have such empathy for these people because the experience is so horrible. And in some ways you live it with them, but you can never truly be a part of it the way that they are. One day well be able to leave here, but they will have to live here and rebuild. On top of that, there are all kinds of secondary perils, of disease such as cholera and dysentery, of all the things that can happen once these bodies deteriorate and perhaps poison the water supply. That is a great risk here. So much fetid water that is left over from the tsunami, great pools of water that has collected everywhere in low-lying areas. There are bodies lying in that and they will become great breeding ground for mosquitoes; also if those bodies cant be retrieved and properly buried or burned, there is great risk that decomposition with set in and that other diseases will result from that. Weve heard from scientists that decaying bodies themselves wont cause disease, but once they get into the water supply and contaminate it, thats where the risk comes in. Its a situation where the people are both physically and emotionally and psychologically traumatized, but they stay busy with the task of trying to stay alive. Q: Banda Aceh is so isolated, is relief getting to the people that need it? The city of Banda Aceh is getting proper relief supplies as there is an airport with a long runway. So relief flights are coming in, water is coming in, food is coming in and there are passable roads. There are means of transportation here and supplies are coming in. They are in process of using heavy machinery to remove some of this rubble. But there is so much of it  even if they had hundreds and hundreds of bulldozers and back hoes  and the clean-up itself could take years. It could take possibly two years just to remove the debris. Now, when you talk about rebuilding and removing all of the bodies, that is going to increase the time factor as well. They are finding bodies everywhere. I watched a backhoe remove debris yesterday and almost with every scoop there was a body coming out of the canal. Its very difficult for people to take. I hired a young translator, who I found in one of the lines waiting for water. He spoke fairly good English, so I asked him to help me in compiling my stories. He lived in the area that was not hit as badly and his family all survived. He went with me to some of the devastated areas, but hed never seen a dead body before. So it was quite a shock for him and difficult for him to process. So there is that kind of psychological trauma that continues here. There will be relief that will begin to make a difference in the lives of the people that are in inaccessible areas. Some relief organizations have gotten to those remote areas  but for most part the devastation there is still incredible and there isnt proper medical treatment. People there are dying from their injuries and there are some reports of starvation and dehydration and deaths resulting from the tsunami. Q. Any signs of hope? The people, the survivors, by and large are hopeful. Its not a place, surprisingly enough, devoid of laughter. You do hear people laughing. You do hear people continuing with the struggle and smiling despite the grim tasks that are ahead of them. You have to rely on the hopefulness of the people. If that hope were gone completely  hope for the region over all would be a difficult thing to muster. But, you see the people of Indonesia, of Banda Aceh, actually having hope and continuing with the process of their own recovery. They are helping themselves. I saw a group today of Indonesian businessmen, lawyers and doctors. It was a young professional organization and these men were not from Banda Aceh, but from Jakarta and other places in Indonesia. They came here as volunteers; they left their jobs and came to Banda Aceh to do the worst work imaginable. They were going into some of the small villages that have been untouched by recovery efforts and they were there specifically to recover dead bodies and to help with that. These are not men involved on a regular basis in rescue work or recovery work  they are professionals and they were doing the kind of work that would be difficult for most people to stomach. Pulling out decomposing bodies from fetid swamps and from clumps of debris. These are bodies that are very difficult to look at, very difficult to see because these are human being that have undergone an incredible trauma and bodies themselves are broken and bruised and twisted in very difficult positions to see. To see a human being that has undergone such incredible suffering is something that is incredibly moving. These men doing this job and helping out has a duel effect. It gives the person a certain amount of dignity in that they are not left to rot in this destruction that is Banda Aceh. Kevin Sites is an NBC News correspondent on assignment in Banda Aceh, Indonesia. To read more of his reports from the field, see his blog at kevinsites.net. 20 Jan 2005 @ 20:01 by quirkeboy @209.92.185.198 : Sixth sense? ?